Articulate creates simple, powerful software that changes the way the world learns—and we want to spread Articulate love as far and wide as possible. 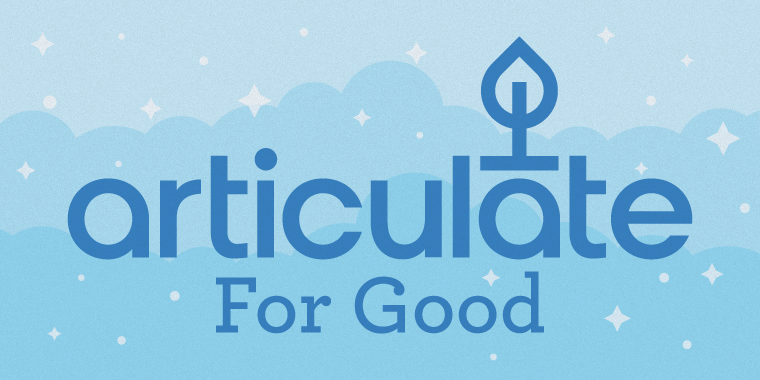 That’s why we’re excited to announce Articulate for Good, our new giving project. Articulate for Good helps nonprofit organizations create and deliver online training with grants that include Articulate software, cash, and training. Your organization can apply for grants to support either existing or new training efforts. We’ll support training that’s targeted at your internal employees or that’s part of the programs and services you offer to the people you serve. We’re excited to expand our support for nonprofit organizations doing amazing work all over the country and can’t wait to see what you create with our support! Your nonprofit is welcome to apply for an Articulate for Good grant if it has current tax-exempt status under Section 501(c)(3) of the Internal Revenue Code. For now, we’re limiting this program to U.S.-based organizations, but we hope to expand it internationally soon! Your organization must match each grant on a dollar-for-dollar basis. This can be an in-kind contribution of staff time. We’ll also need applicants to comply with our reporting requirements, including providing accounting information, progress reports, and images that we can use in case studies and other communications. If your organization is eligible, we’d love for you to apply for an Articulate for Good grant. Just write us a note (Google Doc or Dropbox link to a doc) addressing the following points and send it to 4good@articulate.com by November 30, 2015. Describe your organization’s mission and program activities. Provide contact information for your organization and the person you’d like us to contact about your application. Please also include your IRS tax ID number. Tell us about the training you’ll create with support from your Articulate for Good grant. Who’s the audience for the online training you’ll create? What’s the purpose of the training? How will you measure its success? Please describe your Articulate for Good Grant request, specifying if you’re requesting Articulate software licenses, cash, an Articulate Online account, and/or training. Please provide a project budget and show how you’ll provide your one-to-one match. Tell us your plan for successfully creating and implementing online training if you receive an Articulate for Good grant. Do you have staff familiar with using online authoring tools and learning management systems? How long will it take to realize the expected benefits of the grant? Please provide a timeline that shows when and how you expect the grant to have an impact. Tell us how this grant will support your organization’s goals and mission. If you have any questions, just send us a note at 4good@articulate.com. And if you’d like to stay in the loop about any Articulate for Good news, please add your email address here. We’d love it if you helped spread the word about Articulate for Good by sharing this article with other nonprofits you’re passionate about. Good luck! I appreciate the move but however, before doing this, maybe you could address the bugs and numerous future request which are waiting sometimes for several years. Loyal customers pay a huge amount for SL 2 which brings interesting stuff but still does not cover bug and requests. Even Adobe ( let alone Microsoft) does not do that. Do not get me wrong, I love SL but your customer care is for the least a bit strange. I am just a 2 years user of you product, but I can give you whenever you want dozen of exemples of this. I’m very sorry to hear about your frustration. Please rest assured that the Articulate for Good initiative is not taking any resources away from software development. Our Storyline team is 100% focused on that product and is hard at work on the next version. As is typical in many software development companies, we don’t release timelines or specific feature plans. You can also always reach a member of our staff by posting in the E-Learning Heroes discussion forums or emailing support@articulate.com. We’ll do our best to help you. What a nice idea! Good to help organisationan/people out of your own strength! Unlike Dominque., I am very happy with your staff, the heroes, the community. I learned so much the last year and I never asked something without getting an answer or offered help in one way or the other. I am a walking and talking advertisment for SL, because I am so happy with it and proud of my products!! I as well have been extremely happy with Articulate, and rave about how amazing the support is all the time! Are there any plans to have volunteer opportunities available to work with the nonprofits who receive these grants? What a great thing for you guys to do! I’ve been using Articulate software since Studio ’09, and have had very positive experiences. We now use Storyline, and are very happy with the product. Sure, there are a few bugs – as in most software. But your updates DO try to address them, and I’ve never experienced anything I couldn’t work around. I find the Heroes community to be friendly, helpful, and full of really knowledgeable and creative folks. It’s my first stop for inspiration or guidance. Keep up the good work! It’s really awesome to see you do something to give back and share knowledge. I think this is a great idea and a super way to give back. This probably isn’t allowed in the license agreement, but I would be happy to donate licenses from older versions of Articulate Storyline (SL 1) that we don’t use anymore since upgrading to SL2. Since we upgraded, it may not be allowed, but just a thought. I too have been very happy with the service and quick response to any issue I have had with Storyline. I applaud the initiative for any company to try to assist non-profit organizations. I work for one and finding funding for these programs is always an issue. Since we often wear many hats in a non-profit, we do the e-learning courses off the side of our desk when we can and that sometimes means learning things over again because we don’t use it often. I would love help in developing new courses. I look forward to the expansion of this program to Canada. Wow, just another reason why Articulate is a notch above the rest, from great software, customer support and a fabulous user community, and now unprecedented support for non-profits. What a way to have a positive impact and challenge the status quo, kudos to Articulate and team! Hi Kate! Thanks for the suggestion. We don’t have any specific plans to coordinate volunteers at this point but we’ll definitely consider it. What a fantastic initiative! I echo the sentiments of many here on how great this community and Articulate staff are. I have never had a query go unanswered, and can always count on the heroes for advice and feedback. Nothing but positive experiences from my end! How about coming up with a set of stock courses that NP could use? People management, Articulate training any other ideas? Possibly incorporate the Challenges to develop courses that could be utilised in this way? I work for a 501(c)(3) and would LOVE to apply for this grant. I need to star developing immediately though. Can we purchase the product and apply for the grant for reimbursement? I am excited. I am a vendor for a major non-profit, and I am working on a prototype for delivering learning to field agent in developing nations. We are in the process of using ePub technology for embedding Articulate Storyline interactions to address offline capabilities and low bandwidths. You may be hearing from me or a representative of the organization I work for soon. Hi Richard! Thanks for the question. We won’t be reimbursing past purchases with this grant program. Just let me know if you have further questions! Hi Tony! That’s a great idea. We also partner with LINGOs (http://lingos.org/), and they offer tons of great content programs targeted to the nonprofit market. With this new program, we’re focusing on helping people expand their online content creation. Hi Laura! We’ll look forward to hearing from you. Just send us a note at 4good@articulate.com if you have any questions. I applaud Articulate for making these grants possible! Many nonprofits simply don’t have the monies to purchase software like Articulate or hire someone with the skills to make effective learning happen. This can give them the boost they need. Kudos to you! And thank you. We’re very excited about this grant opportunity. The deadline for submission is November 30. When do you anticipate awarding the grants? I’m working on the bullets to support this request and was hoping you could tell me the value of the Yukon Learning training seats. Hi Emily! Thanks for the question – I’ll find out and get back to you. Is this a one-time grant opportunity, or will you have other grant cycles open in future years? We are not ready to submit a proposal at this time, but likely may be in a year. That way we’ll be sure to include you in any future announcements!